Add a custom blank to your gauge sets for a larger print area. Multiple blanks can be added and they can be printed on both sides. Only $2.00 more per blank added to gauge set. Includes second side printing. Note: When the custom blank is printed it does not include printing on the 1 1/2" blade. 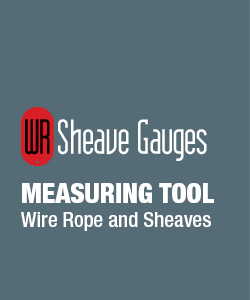 The original plastic Wire Rope and Sheave Gauge which includes a measuring tool for wire rope and sheaves. An excellent promotional item for wire rope cable, sling and rigging equipment for manufacturers and distributors. Available with imprinting with your company logo and contact information in multiple colours. Add a custom blank for a larger surface to display your message. A gauge to measure a worn sheave on the end, together with a rope gauge on the shank, makes this unique from any other gauge available. The +5 format have 14 sizes from 1/2" to 1 1/2" with Metric equivalents. Minimum Production Time for custom orders: 4 weeks. Under 1000 gauges; stock plastic colours are Black, Navy or Red. Imprint any colour onto the gauges (minimum order 100 Gauges). Set up charges included on one colour imprints, quote required for additional imprint colours. Art charges to be added if camera ready art not supplied. Sizes: 1/2", 9/16", 5/8", 11/16", 3/4", 13/16", 7/8", 15/16", 1", 1 1/16", 1 1/8", 1 1/4", 1 3/8", 1 1/2"